Happy birthday JJ! My sweet little girl turned four this week. 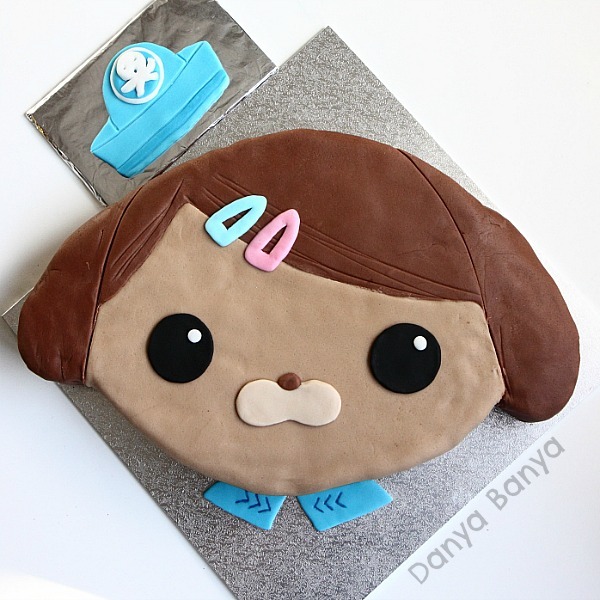 She asked for an Octonauts party, starring Dashi of course! JJ loves dressing up, and so I made this Dashi mask (or would you call it a hat? or a wig?) as a surprise for her to wear at the party. She loved it! To make it, I used a crown that JJ had decorated and worn earlier that week, so I knew it was the right size. I cut off the spikes and hot glued on some cardboard cut to the shape of Dashi’s fringe. I cut cardboard ears, and covered all the pieces with the material from an old brown cardigan that was in my scrap fabric collection, and glued with PVC glue. To make the hat, I pasted blue paper to cardboard and added some details with a blue marker and white acrylic paint, and then glued to the top of the hat. Pegs held all the individual elements together overnight until the glue set. 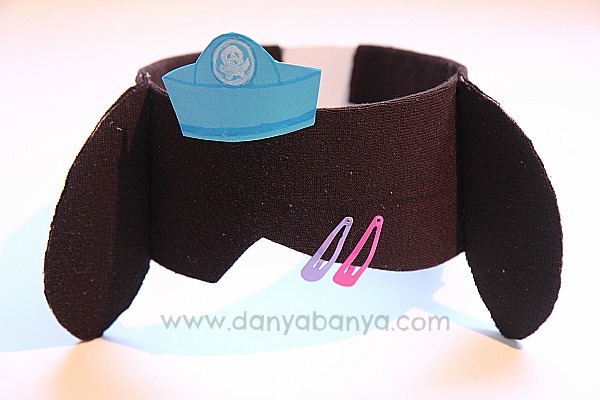 Then I added a few hair clips, and JJ’s Dashi mask was ready! 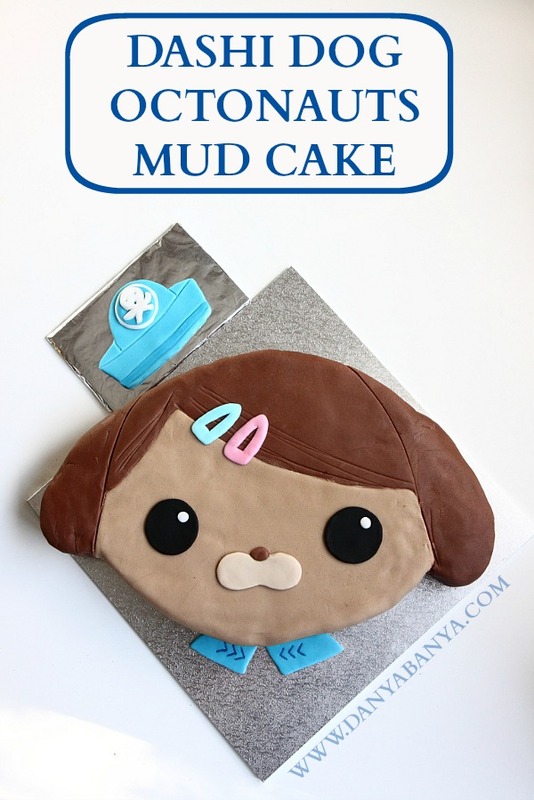 Second to the birthday girl, the star of any kids birthday party is the cake…. I started baking a fortnight before the party and my initial two chocolate cakes failed miserably. I then switched to this large chocolate mud cake recipe and it worked! I used a large roasting tray, and froze the resulting rectangular mud cake for about a week, defrosting it the day before the party. I flipped the cake over so that I could decorate the firm base instead of the crumbly top crust. 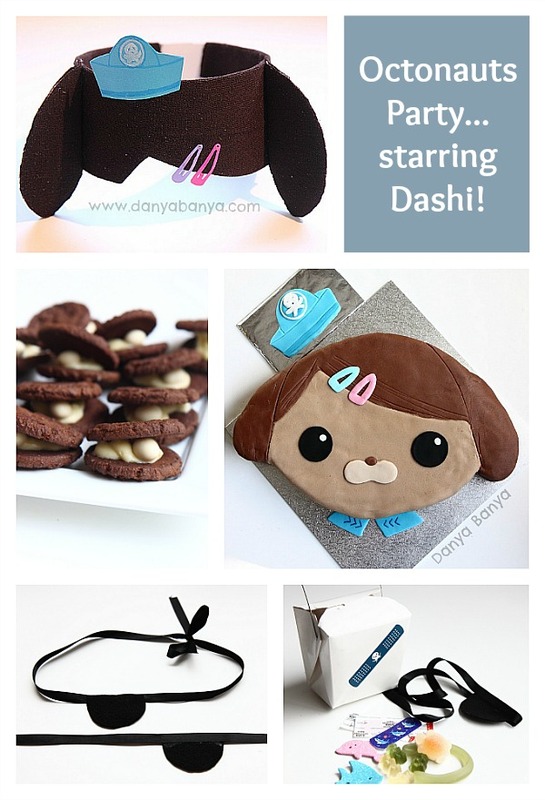 I cut it to Dashi’s face shape and covered with a dark chocolate ganache. 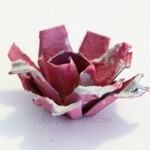 I then used ready to roll icing to add the decorative details. I won’t pretend this cake was easy. It took a lot of attention to detail and several hours to decorate. 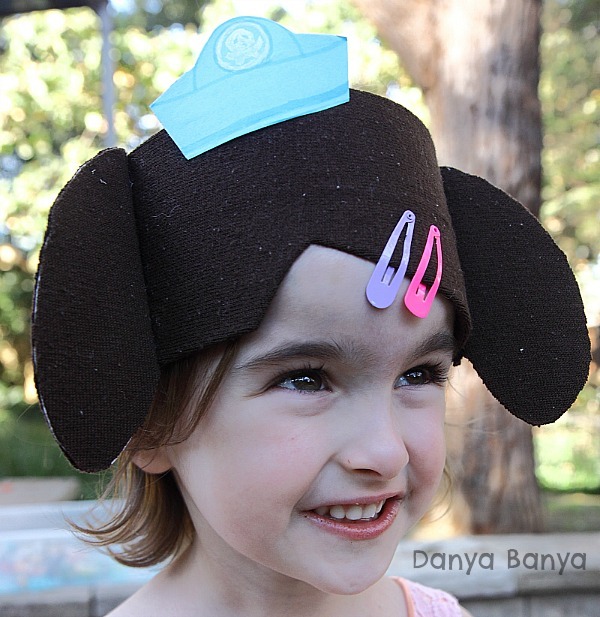 It wasn’t until I had finished decorating her face that I realised I had forgotten one of the elements – her Octonauts hat. As I was already pushing for space on our square cake board, I made a little “cake board extension” using several layers of cardboard wrapped in tape and foil. I tried to balance this aesthetically by adding her blue collar below her face as well. Despite the hat debacle, I still think this is the best cake I’ve ever made. 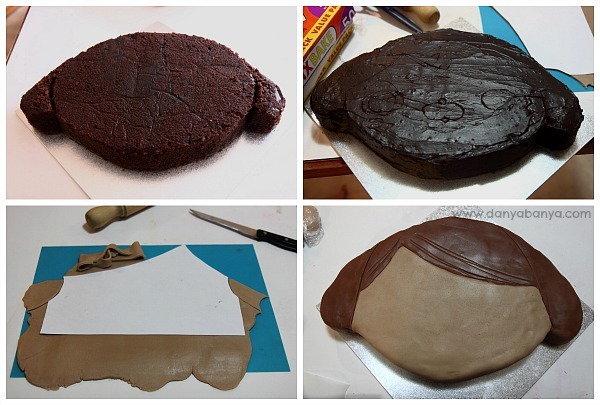 It was moist, dense, chocolately, not too sweet and easy to shape. I received so many compliments! 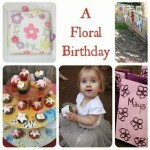 And, most importantly, the birthday girl thought it was amazeballs. Here she is blowing out the candles (with a little help from her friends). I intentionally didn’t over cater as I was concious that the kids would be going home to dinner shortly. 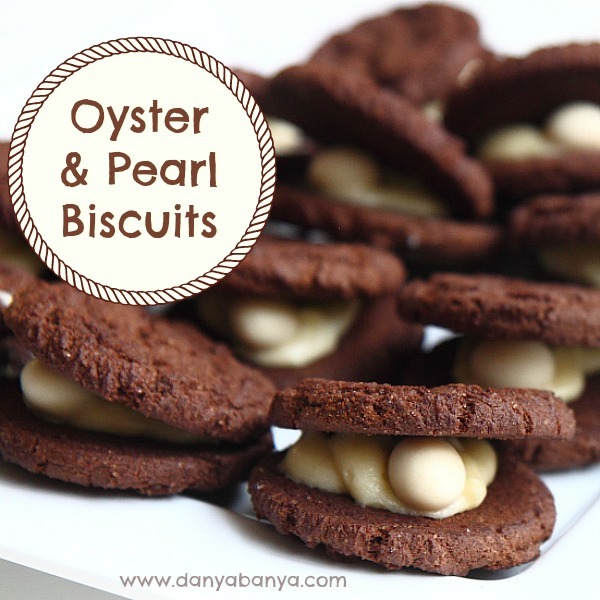 I did put out some mini packets of sea animal biscuits shapes, and these cute little oyster & pearl biscuits that I made using Choc Ripple biscuits, icing and yogurt covered sultanas. The preschool has a large sandpit, so I made sure to bring plenty of buckets and spades. I also included various sea creature moulds and cookie cutters to lend an Octonauts theme to the sandpit play. These Octonauts free printable colouring in activity sheets only took a few minutes to print off. Paired with washable markers and crayons in a quiet corner of the playground, I thought this would make a calming activity for any kids that were overstimulated or needed a time out. On the day I noticed that this area was also used by some of the younger siblings who weren’t quite able to keep up with the ruckus of a preschooler filled playground. These were really easy to make and look quite effective. 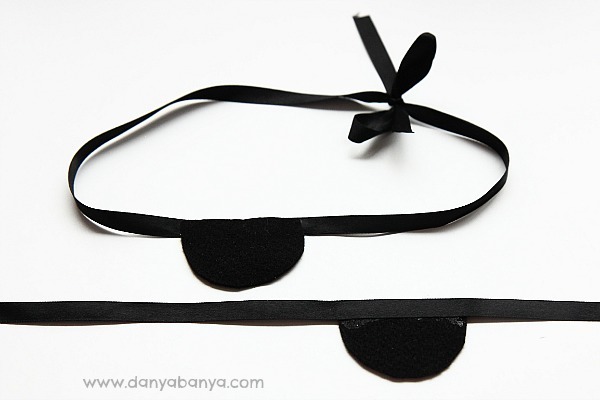 I just cut semicircles of felt, glued them to strips of black ribbon with PVC glue, and pegged them on the washing line to dry. There’s no need to be too precise with the glue, as the glue dries clear, and you don’t see the back when the kids are wearing them. I made one for each of the party favour / loot bags, and an additional fifteen to act as Kwazi dress up props for the actual party. It was adorable seeing all the little pirates, especially the toddler ones! I had also intended to also make some cardboard Dashi camera dress up props that they could wear around their necks, with a cellophane eye piece for the kids to look through, but alas I ran out of time…. What’s the time Captain Barnacles? If you are looking for more easy Octonauts games, you could try “Shark, Shark, Seal!” which is an oceanic twist on the classic game “Duck, Duck, Goose!” I had this game idea up my sleeve in case the party needed jazzing up, but the kids were having so much fun playing together that we let them be. 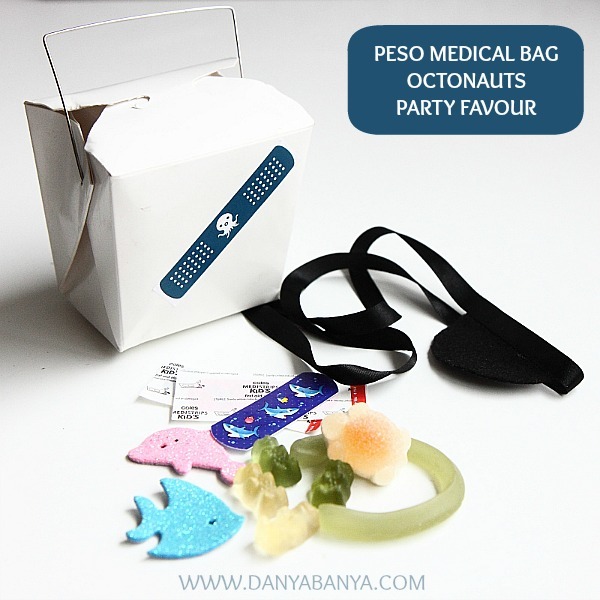 Peso carries his little medical bag with him everywhere, and I thought this would be a super cute party favour / loot bag idea. I think our party was, by a four year old’s standard, a huge success. The weather smiled on us with 280C temperatures (outstanding for Sydney in late May), the kids played happily and the parents were free to mingle. We came home to a (relatively) clean house 2 hours later with one exhausted but very happy Dashi Dog. Yay! Happy birthday sweet JJ. And now you are four…. Lucky toddler to have a skilled and sweet mom! Great job, Danya! Happy birthday, JJ! What an amazing party!! I love how the cake came out. I hope you will come share it at Sharing Saturday!! 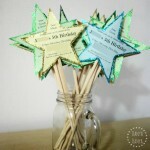 Love all your party ideas. You did a fantastic job! The cake is amazing! 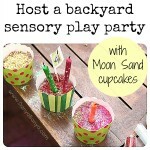 You are so lucky you could use the preschool for the party. Thank you! And yes, so so lucky. It was a perfect venue (minus the lack of prep time). There's so way we would have been able to invite everyone otherwise…. What an AMAZING party! My boys would have had a ball. 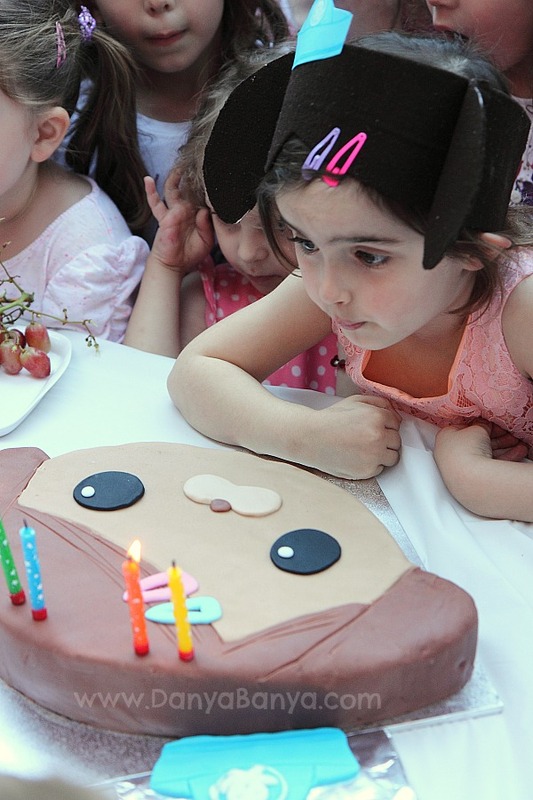 Awesome cake and mask – love it! Amazing job. Very clever way to handke Dashi cake as she and Tweak are not really good shape for cake. It is a hat after all you started with crown to make it. Clearly little girl enjoyed her party and that is most important part. 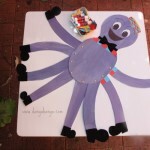 Preschoolers(children 3-5yr old they aren’t toddlers once turn 3) can be quite hard to please. She liked it so you ment very difficult standards to meat 4 yr olds can be so fussy. Sorry ya had to try few diffrent things to get cake right but at least where smart enough to try ahead of time to figure out a solution to the problem.